It was amusingly ridiculous, the trouble it took to get a copy of this book. First, I thought I'd already reviewed it, years ago. Turns out I'd reviewed another of the author's novels (and hadn't even labeled that one properly, so almost didn't find it). Next, I forgot all that I'd learned during the Cybils about ebooks and Mobi and Epub and took forever to get it uploaded - my fault entirely. When that FINALLY came together, I started reading, and within the first three pages laughed. Oh, yeah. I HAD read this book before. And it was just as snarky-funny as it was the first time. Reader Gut Reaction: SAVING THE PLANET & STUFF is an old-school crossover. The main character is confused, but intelligent, the subject matter interesting to a wide audience, and the gentle - but accurate - digs at counterculture, ecoculture, aging adults, alarming teen girls, vegans, and others are peppered throughout, keeping the chuckles coming. Though the main character is supposed to be sixteen, I could see enjoying this both as a sardonic and smart upper middle schooler, and as an adult. 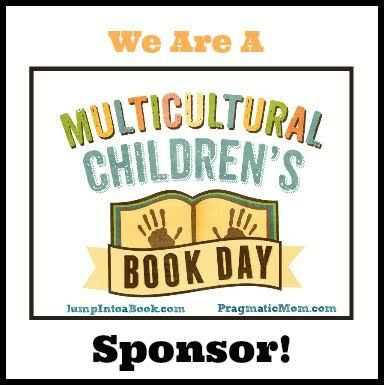 As I'd read before with A Year With Gus & Spike or Happy Kid, the author is good at creating realistic boy characters who are clueless yet intelligent, observant, and blurt out some home truths that adults at times do not want to hear. Hypocrisy is really hard to support with these goofy-but-wise guys hanging around. Concerning Character: Michael Racine III comes from a family of ordinariness that is mind-numbingly, eye-glazingly borrrrring. He's pretty sure he's good at nothing, too - and in tiny ways, it's beginning to gall him. He had a job, but it... well, ended, which means he's sure wandering off to Vermont with his grandparents' aging hippie friends, Nora and Walt will provide fodder for a much more fascinating summer - more along the lines of the adventure of being in Spain or working at a summer camp or as an assistant on an archaeology dig, which is what all his friends are doing. Going to be a "gofer" at The Earth's Wife, an ultraconservative, old-school environmental magazine he's only heard of disparagingly from his grandfather is kind of a lame gig, but a lame gig is better than nothing, right? Right? 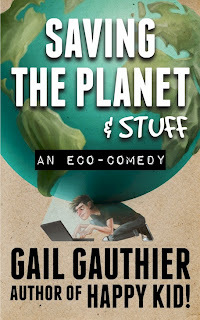 Recommended for Fans Of...: While I cannot ever say I've read something in the genre of "eco-comedy," this one is for fans of Saci Lloyd's books, including THE CARBON DIARIES, Carl Hiaason's HOOT, FLUSH, SCATand CHOMP; and other books with a focus on environmental impact. Cover Chatter: I like both covers of these books - the original novel form, and the ebook form, because the planet is centrally featured. The original has some good natural features - the little recycling symbol is the symbol of Nora's conviction that everything can be reused, including everything currently being stuffed into the the spare rooms of the house; I am only said that there's no picture of a composting toilet. 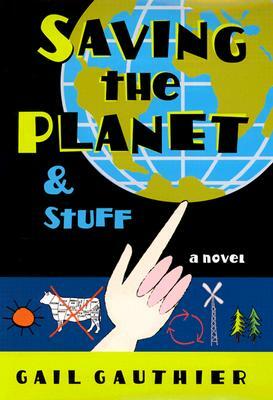 The ebook cover depicts Michael bent under the weight of the planet while just trying to send email. Both covers fit so well with the story. Especially knowing that the ebook was self-pubbed, I'm curious as to how the newest design was completed - and what all goes into these types of decisions. FTC: Wonderland received a copy of this novel courtesy of the author. 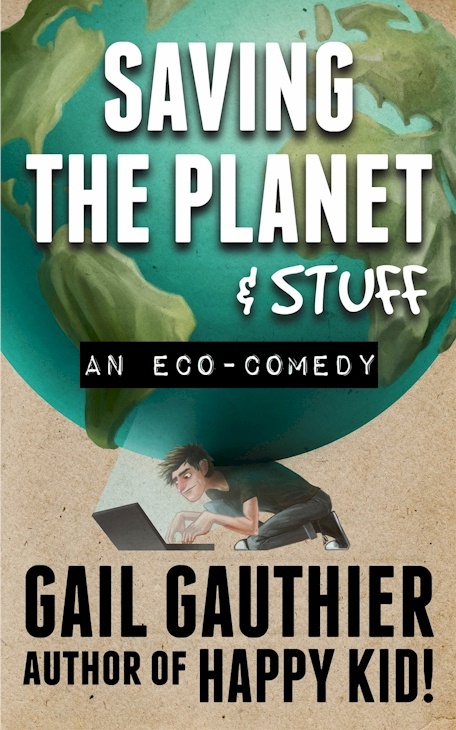 You can find your copy of SAVING THE PLANET & STUFF by Gail Gauthier online, or at an independent bookstore near you! As it turns out my illustrator had very specific reasons for his choices regarding the cover. And I know them! I'm looking forward to talking with you about it. @ Gail: Looking forward to chatting on Friday about it. Anyway, I'm going to have to get a copy of this one. I really like Carl Hiaasen's books for MG readers, and I keep cracking up already at The Earth's Wife.